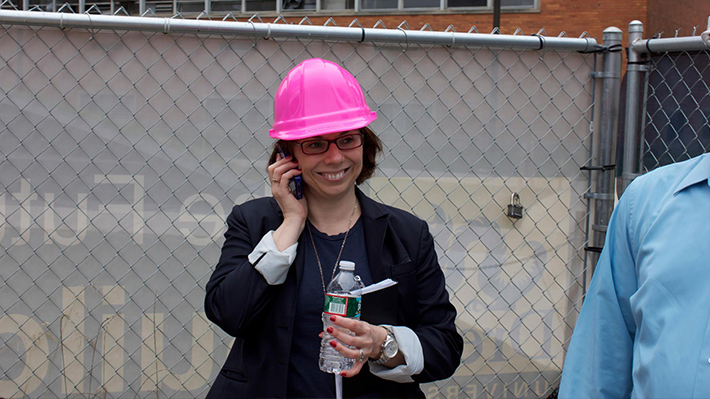 Home › News › Drexel LeBow Relies on "Ms. Fix-It"
At a business school that emphasizes career planning during freshman orientation, Drexel LeBow Associate Dean Anna Chrulkiewicz followed a decidedly different professional path. Her latest solution soars 12 stories above 32nd and Market streets. When the Drexel community gathers Oct. 2 and 3 to celebrate the opening of Gerri C. LeBow Hall, it is Chrulkiewicz they can thank for the unheralded fixes to unseen snags, the kind of things that could have become major complications, but didn’t. For Chrulkiewicz, home originally was Bialystok, Poland, where she was a contented college student studying linguistics when she received notice that she had won a U.S. immigration lottery and could move to America anytime within the next three months. She did not speak English. She had not entered the lottery. She emigrated on Sept. 16, 1991. The Polish community in the Port Richmond neighborhood took her in and the ESL program at the University of Pennsylvania taught her English. She earned a 4.0 and won multiple scholarships at the Community College of Philadelphia, where an adviser insisted she major in hotel and restaurant management as her only plausible career choice. She went on to earn her bachelor’s in hotel and restaurant management at Drexel, where she added a minor in business. She was working at the White Dog Café, often serving as a de facto general manager, when a former teacher hired her as the secretary for Drexel’s Executive MBA program and charged her with making operational improvements. Chrulkiewicz took the job for access to Drexel’s employee tuition benefit and earned a master’s in information science. And then she started stumbling across problems that needed fixes. Budget coordination? Check. Managing course scheduling? Check. Classroom technology for the Pearlstein Business Learning Center? Check. Creating and managing technology teams to oversee instructional technology, faculty and staff computers and the web site? Check, check and check. So when it came time to write the program plan for a proposed new building – a plan outlining all space and functionality requirements – Chrulkiewicz formed faculty-staff committees to determine the needs for classrooms, experiential learning, engagement, technology, and faculty and staff offices. And then she started writing. In a sense, Gerri C. LeBow Hall was born in Anna Chrulkiewicz’s computer. Amid this week’s celebrating, Chrulkiewicz still has worries, among them this these: Is the building large enough to accommodate College growth in the coming years? And, will people like the furniture she selected for its comfort, appearance and durability? Given the long lead-time, “It was like buying shoes a year before you wear them,” Chrulkiewicz says. LeBow’s associate dean still is not a big fan of planning her career. But asked what her next job might be, she suggests disaster relief. “I like chaos,” she explains. It gives her something to fix.